PARNEVU T-Tree Growth Crème penetrates the scalp with T-Tree's all-natural anti-inflammatory and anti-bacterial agents, restoring the scalp and promoting growth. Directions for Use: Scalp Treatment - Apply a generous amount daily to entire scalp. Massage into the scalp for 1 to 2 minutes. Brush or style as usual. 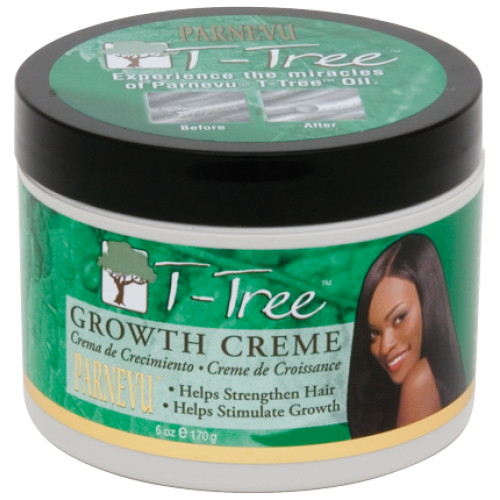 Hair Treatment - Apply daily by massaging into hair from root to end. Re-apply to dry, damaged hair and scalp as needed. Excellent for natural, relaxed, pressed, curled, or color-treated hair. INGREDIENTS: Water (Aqua, Eau), Steareth-20, Glycine Soja (Soybean) Oil, Polyquaternium-37, Propylene Glycol Dicaprylate/Dicaprate, PPG-1 Trideceth-6, Lanolin, Steareth-2, Laneth-15, Melaleuca Alternifolia (Tea Tree) Leaf Oil, Equisetum Arvense Extract, Salvia Officinallis (Sage) Leaf Extract, Urtica Dioica (Nettle) Extract, Hydrolyzed Wheat Protein, Panthenol, Phenyl Trimethicone, Dimethicone, Soluble Collagen, Hydrolyzed Keratin, Tetrosodium EDTA, Glycerin, Fragrance (Parfum), Methylparaben, Propylparaben, DMDM Hydantoin.